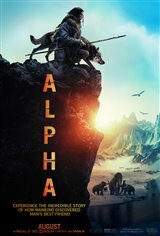 Set 20,000 years ago during the last Ice Age, a young man named Keda (Kodi Smit-McPhee) embarks on his first hunt for bison with his tribe. When the bison stampede and Keda is injured falling off a cliff, the tribe mistakenly believes he's dead and leave him. When he comes to, Keda has to survive in the wilderness. Attacked by a wolf pack, he injures one, but can't bring himself to kill it. He carries the unconscious wolf to a cave, where he cares for it, bringing it food and water. Slowly, the wolf comes to see him as a friend and the two form a close bond as they fight to survive the harsh winter.